Last week I got my iPhone XS, and decided to check charging rates. First I used the default 5W charger, that the phone came with... the day after I used a 30W adapter (incl. a USB-C to Lightning cable). • As you can see, there's 'only' a 1 hour advantage over the default 5W adapter, the biggest gain is made in the first 30 min. Now I'm wondering, would it make any sense to get an even faster charger in the near future, in order to have more time advantage? Does anyone know what the limit is, that the XS can take? Last edited by The_Prodigy1982; 10-01-2018 at 01:10 AM. Annie_8plus and mumfoau like this. With the capacity that iPhones have , I think fast charging should be much faster than what Android phones have, but currently even Android phones with 4000mAh charge faster than 2 hours. Interesting, so what happens if you start fast charging at 50% ? this is a circumstance familiar to me, where I know 50% will not carry me through to my return to my charger, and I need to leave soon. Thanks for the review. I personally like the fast charging. Yes, an hour for fully charged makes a difference and so does the other levels. I think saving an hour has great value! Great information, btw! Thanks for sharing! I enjoy fast charging as well. Especially when charging from 20-80%. It's designed to charge faster when the battery is lower then slows down as it gets full. I remember last year seeing a graph of 5W vs 12W vs fast charge vs 5 and 7.5W wireless charging and the 12W iPad charger was nearly as fast to the 90%+ range as the fast charge setup. The difference was in that first 20-30 minutes or so. My personal advice is not to go faster than an iPad charger. Fast charging is ruining your battery over a long time. Do you still have the link for that article ? It was very interesting but I lost it. Sorry no it was like a year ago. Maybe search the imore site I think it was an article linking to the actual site that had it. Nice review, thanks. I use the 12W iPad charger, happy with that. ladyc0524 and anon(62000) like this. All I use now is Anker 30W Bricks and no issues. Yep that's it! I don't normally need the "X amount of charge in 20-30 minutes" benefit of a fast charge so that article was what convinced me not to spend the extra money on the hardware since I already have a bunch of 12W iPad chargers laying around. I agree. I think staying between 7.5W and 12W fast charging is your best bet...and from doing research choose a wireless fast charger with Qi technology which is what Apple uses in the newer wireless charging iPhones. Yep the first 30 mins is noticeable on my iPhone XS Max. It is nice for when I really need it otherwise I don't care. I use my USB-C brick w/ USB-C to lightning cable really only at work. At home I just use the iPad brick. I don't think its even worth the money. Plus it damages the battery by creating more heat. Unless you absolutely need it its not worth it. I'm pretty sure it's 30W because when you read the description for each adapter on Apple's site they stop mentioning the iPhone compatibility after the 30W charger. By the time I notice anything bad with the battery I would have upgraded. Spencerdl and BreakingKayfabe like this. I pretty much just use my 10W fast wireless chargers for topping off. I still plug in for overnight charging until I get a wireless charging stand that sits up. I enjoy rolling over in bed and looking at my screen. does it have fast charging? mine charges super slow. my wife has a samsung and her phone is fully charged in 50 minutes or so. 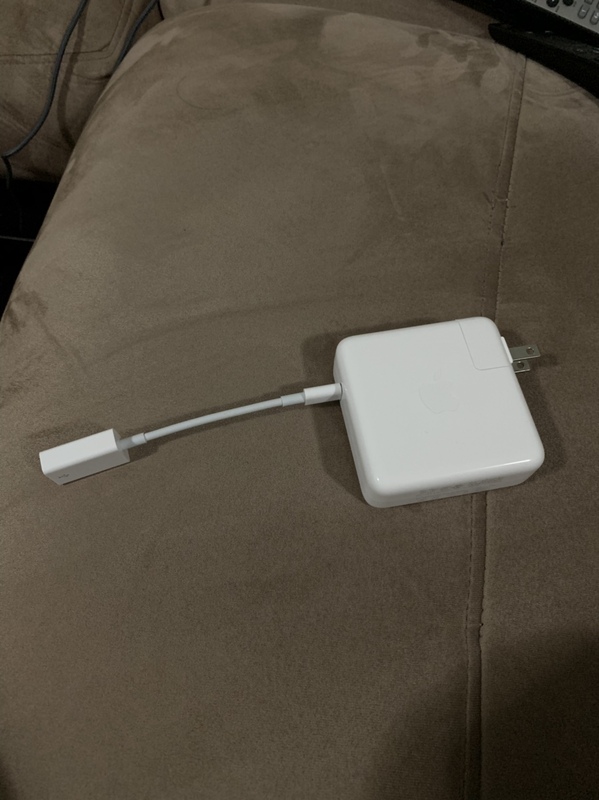 Using a MacBook Pro brick with apple usb-a to c adapter. Glad I don’t have to shell out $19 for apples lightning to usb-c cable which never last long. Does anyone else have to wake their iPhone XS Max in order for it to charge?